The Maldives (/ˈmɒldaɪvz/ ( listen) or /ˈmɒldiːvz/), (Dhivehi: ދިވެހިރާއްޖެ , Dhivehi Raa'je), offeecially Republic o Maldives, is an island naition in the Indian Ocean formed bi a double chain o twintie-sax atolls stretchin in a north-sooth direction aff Indie's Lakshadweep islands, atween Minicoy Island an Chagos Archipelago. It staunds in the Laccadive Sea, aboot seiven hunder kilometres (435 mi) sooth-wast o Sri Lanka an (250 mi) sooth-wast o Indie. This chain o islands is the centrally locatit archipelago amang the Lakshadweep-Maldives-Chagos group o islands, which are in reality the tops o a vast unnersea submarine muntain range, in the Indian Ocean an the Arabian Sea. 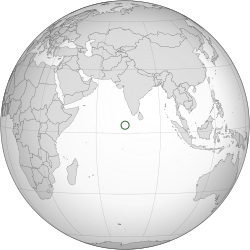 The atolls o the Maldives encompass a territory spread ower roughly 90,000 square kilometres, makin it ane o the maist dispersed kintras in the warld in geographic terms. It features 1,192 islets, o which twa hunder are inhabitit. The Republic o Maldives's caipital an lairgest ceety is Malé, wi a population o 103,693 (2006). It is locatit at the soothren edge o North Malé Atoll, in the Kaafu Atoll. It is an aa ane o the Administrative diveesions o the Maldives. Tradeetionally it wis the Keeng's Island, frae whaur the auncient Maldive Royal dynasties ruled an whaur the palace wis locatit. The Maldives are the smawest Asian kintra in baith population an land aurie. Wi an average grund level o 1.5 metres (4 ft 11 in) abuin sea level, it is the lawest kintra on the planet. It is an aa the kintra wi the lawest heichest point in the warld, at .3 metres (7 ft 7 in). ↑ "GeoHive – Maldives Population". GeoHive. Archived frae the oreeginal on 25 February 2015. ↑ 10.0 10.1 10.2 10.3 "Maldives". International Monetary Fund. ↑ "Lets learn more about Maldives Island". Smartmaldives.com. Retrieved 2010-06-30. ↑ 15.0 15.1 Henley, Jon (11 November 2008). "The last days of paradise". The Guardian. London. Retrieved 12 May 2010. This page wis last eeditit on 30 August 2018, at 13:38.